The Proven Treatment to Heal Your Chronic Back Pain Learn more about your condition and the actions you can take to reduce back pain. If you have not been diagnosed with a major spinal condition, or disease, I recommend that you considered vigorous workouts, non-anaerobic exercises, stretches and practice healthy sitting, standing, leaning, lifting, and sleep on quality mattresses. In addition, learn more about how loose attire, heat/ice packs, and bed rest to see how it can reduce your pain. 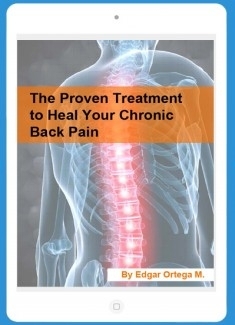 Chronic Back Pain, Pain, Back Pain.